The species like other members of the genus are easy to raise from seed in-vitro and wild collection is unjustified. 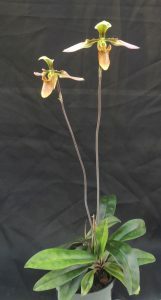 However we have seen hundreds of illegal wild Paphiopedilum plants for sale in Laos and India. These illegal plants do find their way into Europe and so it is really important that people only but seed raised plants, and support conservation initiatives for the plants they love. We have had our seed raised plants since 1998 and love this species’ leaves as much as its flowers. It enjoys deep shade in our Warm Asia section where we keep it watered throughout the year. 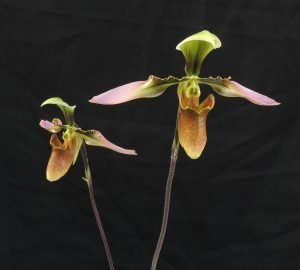 The pouch of Paphiopedilum orchids acts as a temporary trap for pollinating insects that can only escape by pushing their way past the stigmatic surface and then the sticky pollen so pollinating the second flower they visit. One mystery with this species is the very long flower stem. Perhaps its pollinating insect never flies near the ground!